Enveloped, spherical, about 60-80 nm in diameter. Monopartite, linear ssRNA(+) genome of about 20 kb in size. Genomic RNA encodes for ORF1a. ORF1b is translated by ribosomal frameshifting. Resulting proteins pp1a and pp1ab are processed into the viral polymerase (RdRp) and other non-structural proteins involved in RNA synthesis. Structural proteins are expressed as subgenomic RNAs. Each RNA (genomic and subgenomic) is translated to yield only the protein encoded by the 5'-most ORF except for ORF2b which is possibly expressed through leaky scanning. 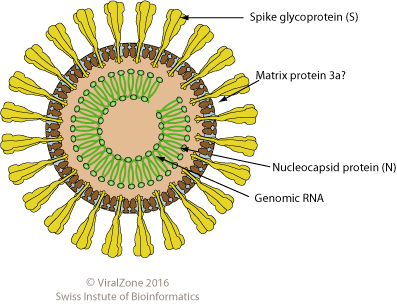 Fusion of virus membrane with the endosomal membrane, ssRNA(+) genome is released into the cytoplasm. ETYMOLOGY Alphamesoni: from alpha-meso(medium-size in Greek) nidovirus.